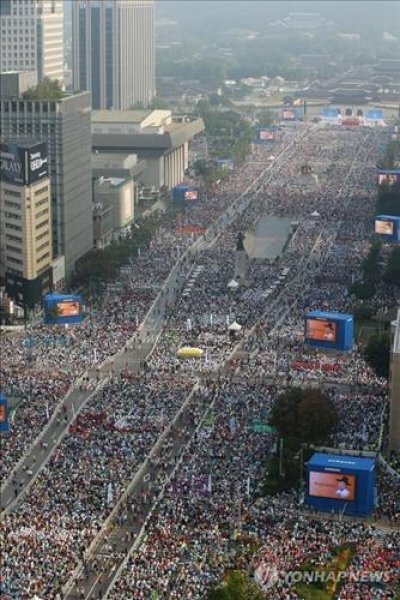 Over a million people crowded Gwanghwamun Plaza, the "heart" of Seoul, for the beatification of Paul Yun Ji-chung and his 123 companions. On the way to the altar, Francis stopped at the picket line set up by the families of the victims of Sewol where he spoke with one of the survivors. During his homily, the Holy Father stressed the importance of listening today to these great witnesses. We "live in societies where, alongside immense wealth, dire poverty is silently growing". During the prayer of the faithful, a Chinese priest asked God for freedom for the Church in his country. Seoul (AsiaNews) - More than a million people gathered in Gwanghwamun Plaza, the "heart" of the South Korean capital, some arriving at dawn, to take part in the beatification Mass celebrated by Pope Francis for Paul Yun Ji-chung and his 123 companions. As the solemn ceremony unfolded, it turned into a summary of the open wounds that still dog East Asia. The pope physically expressed his proximity to those who died in the Sewol disaster and their families, some of whom stood their ground despite the government's ultimatum. During the service, the pontiff criticised the "dire poverty" that stood "alongside immense wealth". In addition, during the prayer by the faithful a Chinese priest carried out an oration in Mandarin in which he asked the Lord for "freedom for the Persecuted Church." Before arriving in Seoul's central square, the Pope stopped for a moment of prayer at the Seosomun shrine where in 1985 John Paul II canonised martyred Catholics. However, for scheduling reasons, the planned baptism of the father of one of the victims of the ferry disaster of 16 April had to be put off until tomorrow. After a brief silent reflection, Francis laid a wreath of flowers and got into the car that took him to Gwanghwamun. The huge boulevard leading to the square, Asia's second largest open space after Tiananmen Square in Beijing, was full of people, Catholics as well as many non-believers and a substantial number of members of South Korea's Protestant Churches in Korea. "We are here because they were the first Christian martyrs," said Rev Chang, head of a congregation on the outskirts of the capital, who spoke to AsiaNews. "Persecution by the Joseon Dynasty hit our community, no matter whether they were Catholic or not. At the time, the schism was not known here in Korea. Paul Yun and the other martyrs are a great example that we all need to heed." As he made his way towards the square, the pope went by the picket line set up by the families of the victims of the Sewol disaster, who have resisted attempts by police to evict them. On his white mozzetta, the pope wore a pin with a yellow ribbon, a token to remember the victims and demand truth and justice from the government. Francis stopped next to the barrier that holds the protesters back in order to speak with one of them. The latter kissed his hand and then hugged him, and finally, gave a note to the pope who took it smiling. When the pope arrived at the altar, the rite began. The Holy Father was accompanied by Asian cardinals (the group already present yesterday, plus the two bishops from Hong Kong, Card John Tong-hon and Card Joseph Zen Ze-kiun) and several Korean bishops. After the rite of beatification and the sung proclamation of the Gospel, the pope began a homily centred on the lives of martyrs, choosing to start with Paul's words about the glory of our faith in Jesus. "Who shall separate us from the love of Christ? (Rom 8:35). With these words, Saint Paul speaks of the glory of our faith in Jesus: not only has Christ risen from the dead and ascended to heaven, but he has united us to himself and he grants us a share in his eternal life. Christ is victorious and his victory is ours!" "Today we celebrate this victory in Paul Yun Ji-chung and his 123 companions. Their names now stand alongside those of the holy martyrs Andrew Kim Taegon, Paul Chong Hasang and companions, to whom I just paid homage. All of them lived and died for Christ, and now they reign with him in joy and in glory." "With Saint Paul, they tell us that, in the death and resurrection of his Son, God has granted us the greatest victory of all. For "neither death, nor life, nor angels, nor principalities, nor things present, nor things to come, nor powers, nor height, nor depth, nor anything else in all creation, will be able to separate us from the love of God in Christ Jesus our Lord" (Rom 8:38-39). "The victory of the martyrs, their witness to the power of God's love, continues to bear fruit today in Korea," said Francis through the Korean translator, "in the Church which received growth from their sacrifice. Our celebration of Blessed Paul and Companions provides us with the opportunity to return to the first moments, the infancy as it were, of the Church in Korea. It invites you, the Catholics of Korea, to remember the great things which God has wrought in this land and to treasure the legacy of faith and charity entrusted to you by your forebears." "So often, we today can find our faith challenged by the world," the pope said. In "countless ways we are asked to compromise our faith, to water down the radical demands of the Gospel and to conform to the spirit of this age. Yet the martyrs call out to us to put Christ first and to see all else in this world in relation to him and his eternal Kingdom. They challenge us to think about what, if anything, we ourselves would be willing to die for." "The example of the martyrs also teaches us the importance of charity in the life of faith. [. . .] Their example has much to say to us who live in societies where, alongside immense wealth, dire poverty is silently growing; where the cry of the poor is seldom heeded; and where Christ continues to call out to us, asking us to love and serve him by tending to our brothers and sisters in need." Right after the homily, the prayers of the faithful were like a list of the region's grievances. In the first, a layman called "for peace and reconciliation among the peoples of Asia." A Chinese priest read the second in Mandarin. "Lord, we are a persecuted Church. But you, God of hope, help us. Although we have heard the Gospel and we are children of God, we suffer. Help us to be autonomous and in communion with the Church, and never lose hope." Then a Korean nun spoke, praying that the seed sown by the martyrs "not be wasted in today's Korea." Finally, a young Korean woman asked the Lord to "protect the nation, give it stability in society and politics, and overcome soon the country's division thanks to its people's sense of brotherhood."